I am just wondering and I may be wrong. Have manufacturers of high-end digital components pared back production? Walk into any reasonably well outfitted audio store these days and you are as likely -- well, more likely -- to see hi-rez LCD televisions as high rez CD players (SACD? - banish the thought). And what with the iPod tsunami, the ongoing vinyl resurgence and the dumbing-down death spiral of popular music in general, a cherished place for truly exceptional digital reproduction is a rare thing. Or so it seems. Oracle Audio Technologies of Quebec will have none of that, however. 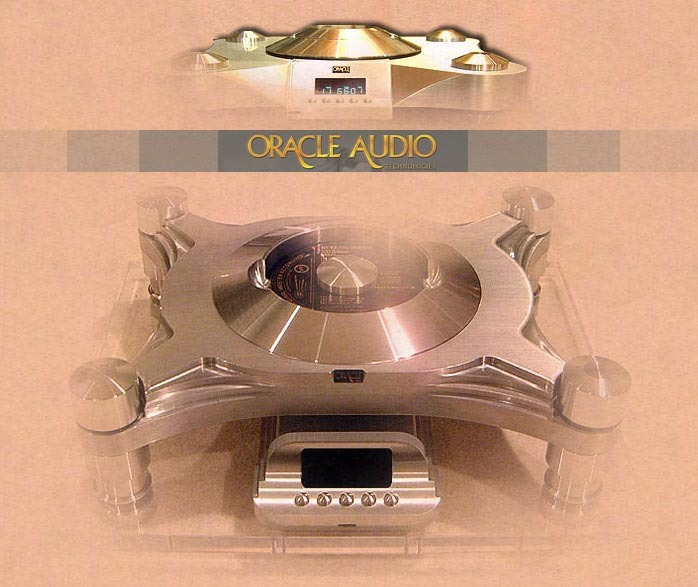 Even while producing exceptional turntables like the Delphi MK V (and slightly lesser beings like my long gone and discontinued Alexandria Mk III turntable), Oracle has not relented in creating extremely capable CD players. 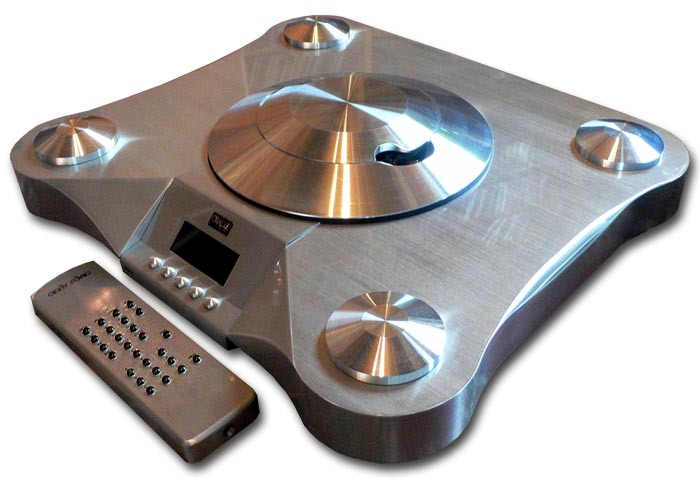 The $9,380 CD 2500 below is perhaps the best known, its reputation for beauty in both sonics and design very well deserved. Established in 1979, Oracle is a statement manufacturer who boldly carves out their own niche in every area of manufacture. 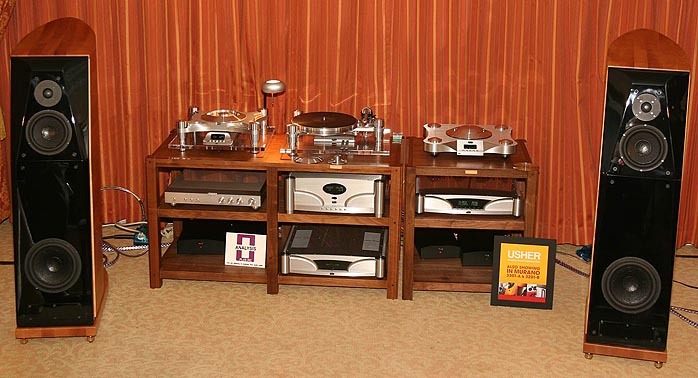 Just one look at any of their products from the Delphi table to the sleek Oracle SME Tone Arm to the massive Si 3000 integrated amp practically shouts stability, class, pristine design and forms which follow immaculate function. But for my money, the best-looking piece of kit Oracle makes is the subject of this review, the CD 1500 CD turntable. Most likely designed to resemble its more expensive older sibling, the CD 1500 is in reality a much better looking machine. As sleek as the Stealth fighter and probably containing nearly as much digital power, the CD 1500 is low slung like an Italian sports car, its hand-brushed aluminum in clear lacquer coating absolutely stunning to behold. Actually, I don't care much for sports car analogies when comparing audio gear. It just smacks of social climbing and equating dollars with value, which is often just not the case (ever drive one of those old Mercedes clunkers?). But the Oracle offers both gorgeous looks and good value for money. 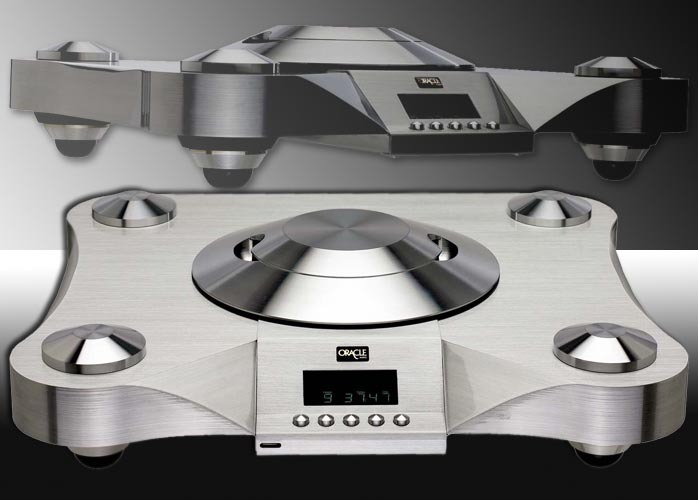 Heck, I would even go out on a thin limb and say that if you can spend $5,800 on an oversampling CD player that must come with an excellent remote, you'd be very hard pressed to better the CD 1500. I believe it to be a statement product, one of the finest CD players I have ever heard and fully deserving of a vaunted Blue Moon award. Yes, it's that good. And in my experience, if digital is good, it's gotta be heavy! The CD 1500 falls in line with that theory and weighs in at 48 pounds. The player arrived in a serious wooden crate within the usual outer cardboard box. Get out your screwdriver. All parts -- remote, cleaner and fine cloth, player top disc plate, magnetic disc, power supply, cables and cords -- arrived very well packed. You pays your money, you gets yer goods. The player itself comes positioned very tightly within a snug, form-fitting Styrofoam capsule from which it may take two people to remove. 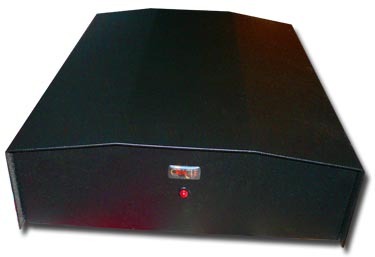 "The CD1500 uses an isolation/vibration control system," reports Oracle's US distributor Rusty Taub. "There is a urethane ring separating the transport mechanism from the main chassis. 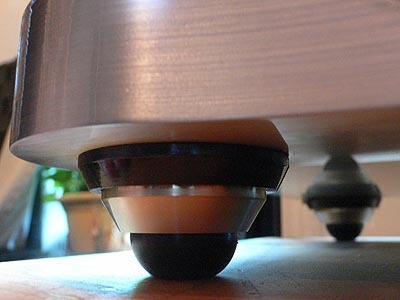 There is also a urethane ring to additionally isolate the main chassis from the footer system. There are also urethane feet. The footer system incorporate Delrin stems to further reduce vibration in the footer system." Furthermore, Lynn at Oracle assured me that any differences between the 1500 and the 2500 are mechanical, not electrical. Where the 1500 uses urethane footers, the 2500 uses larger Sorbethane dampers and its more massive suspension is fully adjustable. But under the hood, the transport and basic electronic abilities/functions are the same. The 1500's output level is 2.4 volts effectively while conversion is handled by a 24-bit Crystal CSA4390 chip. Signal to noise measures 115 dB, dynamic range 106 dB, with 128 times oversampling. The 1500 measures 16.5in x 6in x 14in and is warranted for two years from the date of purchase. urethane four-way footing couldn't have been more impressive and functional and no doubt goes a long way in isolating the player from sonics-destroying resonance and noise. The CD 1500 is equipped with both a pair of Cardas Rhodium-plated analog RCA outs and a BNC digital out, but alas, no balanced outs (though the Model 1000 transport uses an XLR out exclusively). 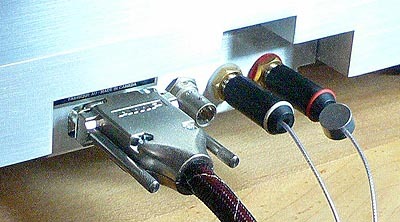 A 15-pin DC out and heavy cord connect the player to its ultra black, sleek looking power supply, which resembles nothing less than Darth Vader's helmet. The power supply's main button (round back) controls the juice, a different approach from some outboard power supplies where the player still controls the on/off. 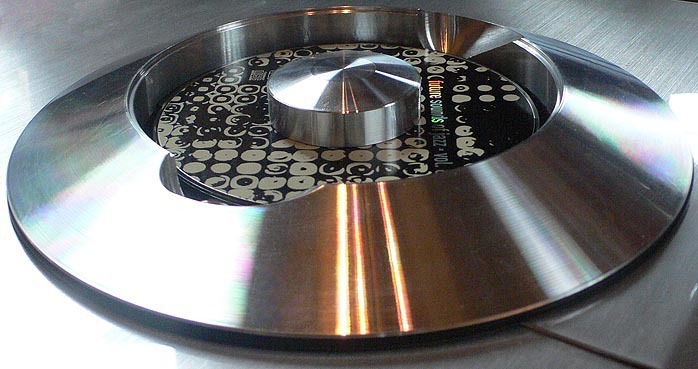 With things wired up, I put the magnetic puck on a CD, placed it in the 1500's well with my fingers nattily fitting into the provided recessed areas, then wondered why I needed to cap it off with the round aluminum top plate. 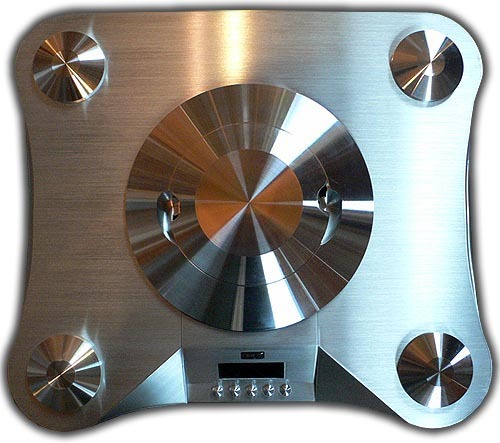 It only seems to sit there (it doesn't screw down) but the manual clearly states: "The performance of the Oracle CD turntable is significantly improved by using the aluminum top cover whenever the player is in use. It provides a darker environment for the laser diode to more accurately pick up signals from the spinning compact disc." Okay, gotcha. CD or the player will only play the number of tracks it read on the previous disc. Okay. Otherwise, the beautiful brushed aluminum remote (the Heather Graham of remotes perhaps?) was pretty straightforward in operation, with a few extras for all that cold hard cashish. The A/B button lets you create a loop on the fly for comparing audio passages, the Prog button allows you to select various tracks of a CD and play them in your chosen order, the Fast button will double the fast forward speed, Repeat, Pause, Play and Stop all do what you expect. Nice to see a well thought out and serious remote accompany such an extreme machine. Alas, you can do some of this from the player's manual onboard buttons: Disc Reset, Down, Up, Play and Stop as needed. So how does this statement player sound? In a word, simple. Oversampling gets a bad rep sometimes and perhaps deservedly so (don't count me in, some of the best oversampling CD players like the Esoterics and the McIntosh MCD 201 sound fantastic), but the CD 1500 sounded simple, natural and just plain right. Its overall focus, particularly after a few weeks of play, was stellar and perhaps its defining trait. It got all the layering and soundstaging drama that we as serious listeners expect in super high rez gear but with a sense of ease that I found thoroughly captivating. I have reviewed many CD players and a few SACD machines as well, and the Oracle practically beat them all (Linn, Krell, Wadia - watch out). It presented a crystal clear but never cold, fatigue-free view of the music that I enjoyed on multiple fronts. If I cared to sing its audiophile praises of extended, tightly wrought bass and crystalline treble, it more than rose to the occasion. If I wanted to engage in the latest writer's mantra of "music first", the CD 1500 was my best buddy. Sometimes when reviewing audio gear, you don't realize anything is deficient until you replace the loaner with something better. That's a good thing. If an audio product makes you happy and has no aggravating faults, that is a product you can live with. But except for the Esoteric X-01 which is the most liquid and glorious sounding player I have heard, the CD 1500 floored me on every front. Again, its clarity was like deep breathing fresh air out in the Rockies. Dynamic, powerful, graceful, extended and sensitive all define this player. It's musical in every sense in which you care to understand or define that term. It portrayed every disc for what it was, well recorded or not, and it got to the heart of the musical performance better than any machine save the excellent Esoteric X-01. Was it forgiving of poor recordings? It certainly didn't gussy up bad sonics with pleasant colorations nor did it make crummy recordings unlistenable. Of course, I could hear huge differences between recordings (one sign of exceptional gear), but the bad ones never made me run out of the room. So rest assured that your old CDs from the late 80s will be listenable and your favorite sonic dishes of a more contemporary cast will, in my estimation, sound better than ever. with pinpoint definition and excellent front-to-back layering, one not of the player itself but of the respective CDs put to it. When you tell the truth, you don't need to gussy it up with long winded blowhard yarns. You just tell it like it is. And with that, I don't have much else to report. I loved this player. If I had the cash, it would be mine. I don't. But perhaps you do and it could be yours. 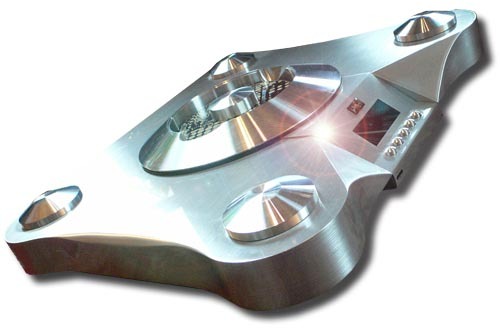 You owe it to your CDs, to your listening room, to your ears to audition the Oracle CD 1500 CD turntable. For those about to buy this player, I salute you!